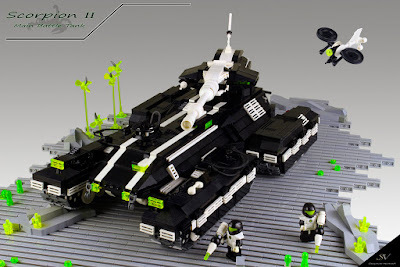 This Blacktron II theme-colored Scorpion Tank (from the Halo game series) styled Battle Machine is built and shared by LEGO Space MOC'er and flickr.com member Stephan Niehoff. According to the creators description the MOC is full of pay functions: the turret can be rotated 360 degrees, the gun barrel can be raised by 45 degrees, the chain runs can be rotated 360 degrees, and the chains work. This an overall a great small diorama featuring nostalgic Blacktrone II theme.